From Amazon's acquisition of PillPack to Best Buy's purchase of GreatCall, over $7.5 billion were spent on digital health acquisitions this year. Updated 12/21 with additional deals. 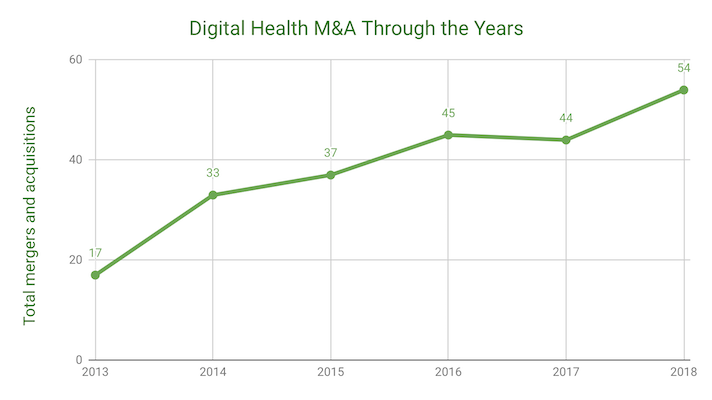 MobiHealthNews has been tracking mergers and acquisitions in the digital health space since 2013, and with the exception of a small blip last year, the number has gone up every year. In 2018, we saw a record-breaking 56 acquisitions and mergers in the space, 13 of which had disclosed price tags totaling $7.6 billion. This year was notable not only for the number and value of the acquisition but also for the high profile of the players involved. This was the year we saw Amazon purchase PillPack, Best Buy purchase GreatCall, Roche purchase Flatiron Health, and, just recently, Resmed purchase longtime digital health incumbent Propeller Health. Not to mention Dexcom and Medtronic, which each made acquisitions in the back half of the year around their diabetes portfolios. Read on for our end-of-the-year wrap up of the year's 56 acquisitions, listed in descending order of deal size, with unknown deal sizes listed chronologically at the end. Johnson & Johnson sells Lifescan to Platinum Equity ​— In October, Platinum Equity completed its acquisition of Johnson & Johnsons' Chesterbrook, Pennsylvania- and Zug, Switzerland-based LifeScan business, which sells the OneTouch line of connected and non-connected glucometers. Platinum Equity paid $2.1 billion for the business, which reported $1.5 billion in net revenue last year. LifeScan President Valerie Asbury will continue to lead the business, as Platinum Equity plans to make the transition as seamless as possible for customers. More. Roche acquires Flatiron Health — Pharma giant Roche completed its acquisition of oncology EHR software firm Flatiron Health in the April. The pharma company paid an additional $1.9 billion over the millions it had already invested into the company in 2016, and as a result of the deal now controls all shares of Flatiron Health. “This is an important step in our personalized healthcare strategy for Roche, as we believe that regulatory-grade real-world evidence is a key ingredient to accelerate the development of, and access to, new cancer treatments,” Roche Pharmaceuticals CEO Daniel O’Day said in the statement. “As a leading technology company in oncology, Flatiron Health is best positioned to provide the technology and data analytics infrastructure needed not only for Roche, but for oncology research and development efforts across the entire industry. A key principle of this is to preserve Flatiron’s autonomy and their ability to continue providing their services to all existing and future partners.” More. 3M acquires M*Modal's tech arm — 3M has agreed to buy the technology arm of M*Modal, the clinical documentation company, for $1 billion. The move enhances 3M's portfolio with the addition of cloud-based artificial intelligence and speech recognition technology. The deal, expected to close in early 2019, will add 750 employees of M*Modal's technology business. The Pittsburgh-based company, which spun off from Carnegie Mellon University will maintain its transcription, scribing and coding services business. Resmed acquires MatrixCare — Just last month ResMed, maker of connected respiratory devices, announced that it is set to acquire MatrixCare, a Minnesota-based EHR company, for $750 million. MatrixCare’s EHR is targeted towards long-term post acute care services, such as skilled nursing facilities, life plan communities and senior living homes. The deal is expected to help ResMed expand its software-as-a-service offerings, specifically in the long-term care setting. The deal is set to close by the end of the company’s second fiscal quarter in 2019. After the acquisition, MatrixCare is expected to remain a standalone business inside of ResMed’s portfolio. More. Resmed acquires Propeller Health — ResMed, followed up its MatrixCare deal with the purchase of Wisconsin-based digital respiratory health company Propeller Health for $225 million. It is set to finalize the acquisition of Propeller Health by March 2019, which marks the end of its 2019 fiscal year. After the acquisition, Propeller is expected to remain a standalone company within ResMed’s Respiratory Care portfolio. According to a release from the companies, there will be no immediate management changes. More. Medidata acquires Shyft Analytics — Medidata, a New York City-based company that offers cloud storage and data analytics services for clinical trials, acquired Shyft Analytics, maker of a cloud data analytics platform specifically designed for the pharma and biotech industries, in June. The transaction valued Shyft at $195 million, inclusive of Medidata’s prior 6 percent ownership in the analytics platform, to be paid in cash. Allscripts acquires HealthGrid — EHR vendor Allscripts purchased patient communication app maker HealthGrid for a potential $110 million — $60 million in cash, with an additional $50 million in earnout payments based on HealthGrid achieving certain revenue targets over the next three years. Allscripts acquires Practice Fusion ​— EHR vendor Allscripts acquired Practice Fusion, a smaller EHR vendor that was an early purveyor of mobile-enabled EHRs and a frequent subject of IPO speculation, for $100 million. Some 30,000 ambulatory sites, serving about 5 million patient each month, currently use Practice Fusion EHR, practice management, e-prescribing, lab, and patient portal technology. "Combined with Practice Fusion, we expect Allscripts to continue to drive innovation in addressing gaps-in-care, improving clinical outcomes and real-world-evidence research," Allscripts President Rick Poulton said in a statement. "Plus, Practice Fusion’s affordable EHR technology supports traditionally hard-to-reach independent physician practices, and its cloud-based infrastructure aligns with Allscripts' forward vision for solution delivery." More. Logisticare acquires Circulation — App-enabled healthcare transportation company Circulation entered into an agreement to be acquired by Logisticare, the nation’s largest non-emergency medical transportation (NEMT) broker, for $44 million, plus $1 million to be paid in three years to each of the cofounders. The price tag on this one is a little bit complicated: the total sale price was $57.5 million, but since Logisticare's parent company Providence has a minority stake in Circulation, $11.5 million is going back to the buyer. Logisticare intends to keep Circulation's entire management team intact, and to deploy Circulation’s technology across its nationwide operations. More. InTouch Health acquires TruClinic — InTouch Health, which markets an enterprise telehealth platform, announced in January that it would be acquiring TruClinic, which specializes in direct-to-consumer online virtual care. The goal of the deal is for InTouch to expand its existing portfolio to deliver a fuller range of virtual care programs to healthcare provider organizations, better enabling continuity of care between physicians and patients, InTouch officials said at the time. InTouch Health will incorporate TruClinic's software into its offering such that patients can now initiate and receive a consult with their health system physician from their home, further extending InTouch Health's telehealth system across the continuum of care. More. AccessOne acquires HealthFirst Financial — In January, patient financing company AccessOne announced the acquisition of HealthFirst Financial, a software-enabled service provider of patient financing programs to healthcare organizations, for an undisclosed sum. The acquisition will allow AccessOne to offer healthcare systems tailored health products — including mobile tools — for their care setting, with the goal of lowering bad debt and improving patient satisfaction scores. More. StayWell acquires Provata — Merck subsidiary StayWell, which offers a preventative health platform for employers, health plans, and health systems, acquired Provata Health for an undisclosed sum in February. Provata Health makes a digital health platform for employee wellness, which includes a chronic disease management program incorporating a connected scale and blood pressure monitor; a lifestyle management platform that incorporates an activity tracker; and a mental health platform that incorporates a VR headset. "We really see this as significantly advancing our capabilities," StayWell CEO Nicole Latimer told MobiHealthNews at the time. "We knew that we would have to get more advanced in terms of offering our programs through mobile devices. Our acquisition of MedHelp was a step in that direction. But as we think about being able to now offer the capabilities that Provata’s platform offers, that advances us by several years. This is something we no longer have to build ourselves, but we can immediately go to market with a very robust set of mobile capabilities. ... Many of the health plans we’ve been working with have been asking for mobile capabilities, so it’s important to have that now rather than in a few years." More. Fitbit acquires Twine Health — Early in the year, Fitbit acquired healthcare coaching platform Twine Health for an undisclosed sum. The acquisition will help Fitbit continue to enter the healthcare world and expand its offerings to health plans, health systems, and self-insured employers, creating opportunities to increase subscription-based revenue, according to a statement. Eventually Fitbit plans on extending aspects of Twine's offerings to its 25 million device users, as well as expanding Twine into new disease areas. “We were already intersecting in the market,” Twine CEO John O. Moore, who now serves as Fitbit’s medical director, told MobiHealthNews. “The one thing we were being asked for by customers that we already had or that we were pursuing was ‘Alright, how do you tie into a more general wellness in our organization?’ and we didn’t have a clean answer to that.” More here and here. MindBody acquires FitMetrix — San Luis Obispo, California-based wellness platform Mindbody acquired FitMetrix, a performance tracking engagement platform, for an undisclosed sum. The Atlanta-based FitMetrix helps wellness businesses, such as gyms, increase retention by letting the companies engage with users, and track their fitness. The platform allows customers to book classes, track workouts, and get communications from gyms. FitMetrix and Mindbody originally teamed up in 2015, giving fitness studios and gyms the capability to integrate digital performance tracking into their locations across multiple classes, according to a release. The partnership allowed business to track, rank, and reward clients in real time using customized workout metrics. More. HIMSS acquires HealthBox — At its global annual conference in March, MobiHealthNews's parent company HIMSS announced the acquisition of HealthBox for its innovation consulting and fund management businesses. Healthbox launched in 2010 as a digital health accelerator, a role it filled for many years as it transitioned to consulting and management. "Healthcare organizations look at us asking if we can help them think through concepts around digital health or how to bring innovation into their systems," Hal Wolf, HIMSS CEO, told HealthcareITNews at the time. More. SCI Solutions acquires DatStat — Patient engagement and care coordination company SCI Solutions announced in April its acquisition of DatStat, a company that specializes in digital health tools and patient engagement, for an undisclosed sum. SCI Solutions’ platform is set up for patient scheduling, referral management, and revenue cycle software. Currently SCI Solutions is used by 1,000 hospitals and imaging centers, and by 13,000 physician practices. The company plans to combine this with DatStat’s digital self-service offerings, which include a tool for patients to prepare for their doctor’s visit, a secure messaging system, visit summaries, and care plans. More. SleepScore Labs acquires Sleep.ai — Contactless sleep tracker maker SleepScore Labs acquired Dutch company Sleep.ai for an undisclosed sum. Sleep.ai, which was founded in 2014, specializes in wearables and apps that let users know if they are snoring. One of its products includes a wearable band can be worn on the user’s arm that vibrates whenever the user rolls on their back and starts to snore. The band also connects to the user’s phone. Livongo acquires Retrofit — Digital chronic disease management company Livongo announced in April that it had acquired Retrofit, a company that specializes in weight-management and disease prevention programs, for an undisclosed sum. The acquisition will give Livongo customers access to Retrofit’s Diabetes Prevention Program. The move will also help Mountain View-based company expand its service, which gives users a ‘nudge’ to remember certain positive behaviors, by integrating more healthcare professionals into the system, including weight-management and nutritional services. More. American Well acquires Avizia — Boston-based American Well acquired fellow telemedicine company Avizia in late Q2 for an undisclosed sum in April. The deal is expected to help American Well grow its acute care capabilities, Avizia’s specialty. The deal will give American Well access to Avizia’s hospital-based cart lineup and custom software workflows for over 40 clinical specialties, such as telestroke and telebehavioral health services. WebMD acquires Jobson Healthcare — Internet Brands subsidiary WebMD, which also oversees the Medscape brand of physician-facing mobile and web-based educational content, acquired Jobson Healthcare Information, another healthcare content group, for an undisclosed amount. The major goal of the acquisition is to bolster Medscape's content across the board, but especially content for pharmacists and eye care professionals, including optometrists and ophthalmologists. Jobson will continue to operate out of its existing offices and offer many of its existing publications. More. Welltok acquires Wellpass — In September consumer health software maker Welltok made another acquisition, this one a long-time player in the digital and mobile health spaces: Wellpass, the company formed in 2017 from a merger of Sense Health and Voxiva. The terms of the deal were not disclosed. The Wellpass acquisition will expand Welltok's presence in the managed Medicaid and government markets, as well as build out Welltok's technology suite. More. Muse acquires Meditation Studio — The last acquisition of Q3, coming in at the end of September, was a second acquisition in the meditation app space. Muse, maker of an EEG headband and accompanying meditation mobile app, announced that it is acquiring Meditation Studio, a developer known for its meditation app which provides guidance from 40 experts. The terms of the deal were undisclosed. More. Mobile Health acquires DoctorBell — Singapore-based Mobile Health, creator of personalize health concierge platform MaNaDr, announced that it was acquiring fellow Singaporean company Doctorbell, a patient engagement platform, for an undisclosed amount. The MaNaDr platform connects users to doctors and their networks. It also gives patients access to their medical health records and lab results so they can carry this information with them on their phone. The system was designed so that patients could use their mobile phones to book appointments, access telemedicine visits and send messages back and forth with providers. Meanwhile, Doctorbell was founded in 2016 and focuses on patient engagement and education as well as provider productivity and communication. More. Prima-Temp acquires Kindara — Prima-Temp, a company looking to leverage machine learning in women’s cyclical health, announced in October that it acquired Kindara, maker of a fertility tracking app of the same name, as well as the Wink Bluetooth-connected fertility thermometer. Terms of the deal were not disclosed. Prima-Temp is looking at the acquisition as a way to cement itself in the digital women’s health marketplace while preparing for the launch of its Priya Personal Fertility Sensor in 2019. More. SilverVue and Mingle Analytics merge — In October, care management software company SilverVue and software-enabled Medicare quality reporting consultancy Mingle Analytics merged to form Mingle Health, a new company that will combine the strengths of the two firms. SilverVue currently offers a suite of tools that deal with transitions of care, post-acute care, and practice performance. Both companies work with all kinds of providers, but provide unique value for private practitioners and smaller hospitals. More. Carbon Health and Direct Urgent Care merge — Carbon Health, a startup developing a mobile platform for connecting patients to urgent and primary care, merged with the Northern California-based Direct Urgent Care network. The result is network of seven brick-and-mortar clinics caring for 40,000 active patients, all of which is supported by a connected telehealth app that also support appointment management, payments, EHR access, prescription fulfillment and other capabilities aimed at delivering a complete continuum of care. More. Medici acquires Docbook MD — Medical messaging company Medici announced that it would be acquiring fellow health communication platform DocbookMD for an undisclosed sum. As part of the deal Medici will now take control or DocbookMD’s technical assets, employees and customer contracts. Both Medici and DocbookMD are Austin, Texas-based and focus on medical communications. DocbookMD, which was founded in 2008, helps facilitate clinician-to-clinician messaging. Medici, on the other hand, has been focusing on provider-to-patient communication. The new deal is expected to help expand Medici’s reach and offer more services to providers. More. GetWellNetwork acquires HealthLoop — GetWellNetwork — a company offering tools to drive patient engagement and support clinical care teams — acquired the digital engagement platform HealthLoop in November. “HealthLoop will become the core digital platform for GetWellNetwork, and we actually will be putting the teams together and just augmenting the HealthLoop network — not the other way around,” GetWellNetwork CEO and founder Michael O’Neil said. “Modules from GetWellGo, the analogue to the HealthLoop platform, will be augmenting the HealthLoop platform with some rich functionality and language globalization, content, telehealth, some things that we do that they actually don’t do yet.” More. Premier acquires Stanson Health — Premier, an alliance of hospitals and systems that uses analytics and other tools to improve care, has acquired clinical decision support (CDS) toolmaker Stanson Health for an undisclosed sum. Stanson’s software integrates with EHR workflows to promote best practices, and is currently active in roughly 300 healthcare locations. More. Mindmaze acquires Neuro Motor Innovations — Switzerland-based MindMaze announced in November its acquisition of fellow neuro-rehabilitation tech company Neuro Motor Innovations Corporation (NMI) for an undisclosed sum. MindMaze will acquire a perpetual license to NMI’s rehabilitation technology and pick up NMI cofounder Dr. John Krakauer as its now chief medical and chief scientific advisor. Krakauer and colleagues founded the company as a spinout of Johns Hopkins University, and still hold a “close relationship” with the school that MindMaze said it is hoping to maintain. More. Medtronic acquires Nutrino — Medtronic has announced that it will acquire long-time partner Nutrino, an AI powered personalized nutrition platform for an undisclosed sum. The acquisition is set to specifically boost Medtronic’s offerings for people living with diabetes and offer the company’s predictive glycemic response algorithm, which will be integrated with Medtronic’s CGM system. "Bringing Nutrino and their nutrition-related expertise into our organization will give us a substantial differentiator in the diabetes industry and accelerate our progress to help people with diabetes live with greater freedom and better health," Hooman Hakami, executive vice president and president of the Diabetes Group at Medtronic, said in a statement. "The Nutrino team has been an outstanding partner over the past few years. We are excited to welcome them to our team, and I have no doubt that, together, we will make a profound impact on the lives of people with diabetes.” More. Tabula Rasa to acquire DoseMe — Tabula Rasa Healthcare, a digital health company focused on medication safety, announced early this month that it has agreed to acquire Australian company DoseMe for an undisclosed sum. The acquisition, which is set to close the first quarter of 2019, means Tabula Rasa will be acquiring DoseMeRx, a platform designed to help clinicians and pharmacists figure out the proper dose of medication for high needs individuals. According to the companies, the platform examines the patients' pharmacokinetics, which includes how well they can metabolize and absorb the medication. After the deal is officially closed, DoseMeRX will be integrated with Tabula Rasa Healthcare’s Medication Risk Mitigation technologies, which target hospital use integration. More. Change Healthcare acquires PokitDok — Change Healthcare — a provider of health IT software that ranges from network data analytics to revenue improvement — announced the acquisition of several key assets from blockchain-focused API startup PokitDok, including its software, IP and employees. Terms of the deal were not disclosed. Change (in which McKesson also has a hefty stake) said in its announcement that it would be integrating certain PokitDok APIs into its Intelligent Healthcare Network for payers, providers and software vendors. In particular, today’s announcement highlighted the inclusion of PokitDok’s various blockchain capabilities and how they could improve the network’s integrity and efficiency. More.